THE NORDIC FIT: Monochrome Monday. I usually tend to dress on a rather wide scale from formal to casual. The formality almost always follows the week, Monday being the most formal. However, as the dress code in Finland is quite loose, I usually start sliding down to casual quite fast as the week goes by. This is an example of a Monday, from a few weeks back. 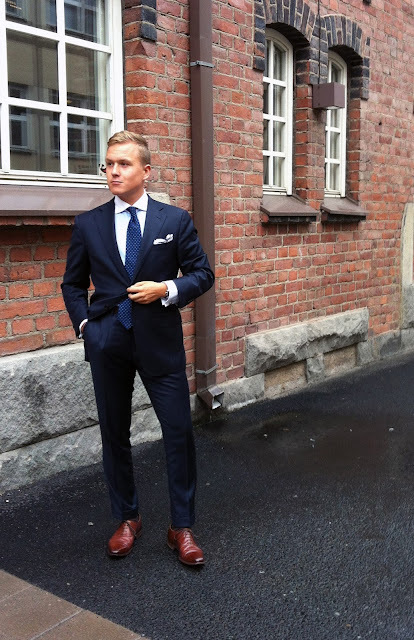 A slim navy suit with notched lapels and a semi roped Italian shoulder for a nice silhuette. This is where most cheap and fashion brand suits fail, as their heavy padding at the shoulders and fused chest pieces they tend to create a boxy and unnatural looks. Right sleeve length assures you look sharp as your cuffs show about a half an inch or even a bit more, as the case is with most of my suits and jackets. As this combination is a basically just different blues, there are a few things a spice it up. I've chosen a contrast collar double cuff shirt, which is something I think surely works sometimes, as long as you don't go all Gordon Gekko every day. Furthermore, it is basically the only out of the oridinary piece I'm wearing that day keeping the overall look still simple. The slightly dandy way of folding my pocket square adds an another ounce of flair into the combination. 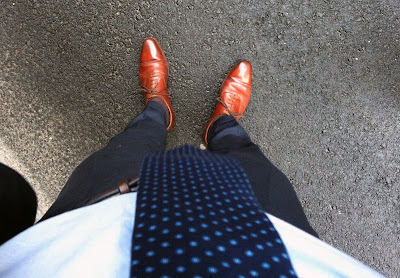 Shoes are Hallam cap toes from Crockett and Jones. The chestnut color is a viable option here, but if I worked in a bank or lived in a city like London, I would probably go with black oxford shoes. Here in Finland brown works well, and the beautiful shine and the deep color alone makes you look a million times sharper than your boss in his boxy and rubbery Eccos. Accessories is where you finally differentiate and stand out. You don't need to go for a peacock look to be noticed, a simple good fit, quality shoes and well picked accessories. Here I've chosen simple silver knot cufflinks, a white silk pocket square with a navy border and polka dots and to top it off, a navy E. Marinella 7-fold silk tie. One (important) notion here, DO NOT go with an ugly Windsor knot. 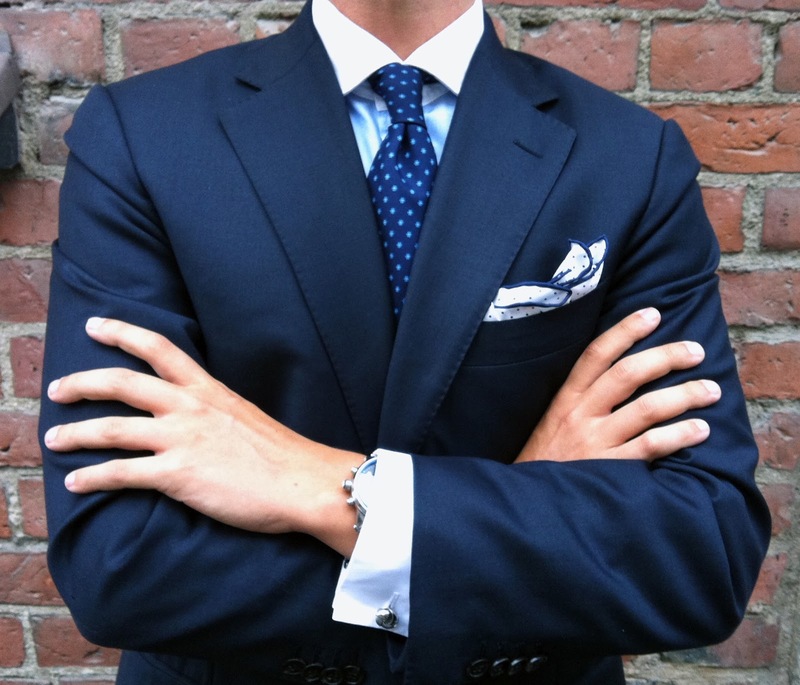 A well-tied four-in-hand is the only option for a modern gentleman. Furthermore, it can be a bit difficult to tie a beautiful knot onto a cheap market tie, so there is another reason to invest into quality ties. E. Marinellas have the ideal thickness and the sort of softness in the silk for me, and I feel I could never have enough of them. At the end of the day, and unless you're in an ugly black glue suit from your local market, it all comes down to how you carry your clothes. Good fit and quality materials quarantee you look stunning, and this can all be achieved with a moderate budget if you only do little bit of ground work and embrace the Internet (especially eBay) as your supplier.